Whether Moon decides to permanently station THAAD in South Korea or have it removed will create political challenges for his government. Presumably in late June, after U.S. President Donald Trump and North Korean leader Kim Jong-un’s summit may happen, South Korean President Moon Jae-in will face a dilemma regarding the deployment of the Terminal High Altitude Area Defense (THAAD) U.S missile system in South Korea. The outcome of the Trump-Kim summit, and any agreement on denuclearization of the Korean Peninsula, will influence Moon’s decision. However, whether Moon decides to permanently station THAAD in South Korea or have it removed will create political challenges for his government. The clock for the denuclearization of the Korean Peninsula has been ticking fast. This has happened despite Trump’s abrupt decision to pull out of the planned talks in response to North Korea’s own threat to call off the summit. On May 26, Moon’s surprise meeting with Kim at the Panmunjom Peace Village on the demilitarized zone appears to have salvaged the canceled Trump-Kim summit meeting. So far, it U.S officials have resumed negotiating with North Koreans to set up the potential meeting. During the inter-Korean summit of April 27, Moon and Kim agreed to “complete denuclearization” in the Panmunjom Declaration. This joint statement has laid the groundwork for Trump’s meeting with Kim. In early April and May, U.S Secretary of State Mike Pompeo met Kim twice in Pyongyang. And in New York, his meeting with Kim Yong-chol, a high-ranking North Korean official and former intelligence chief, will finalize details for the June 12 summit in Singapore. Unlike the topic of denuclearization, however, the deployment of THAAD remains an open and conflict-provoking question in South Korea. On April 23, 2018, at the THAAD site in the southern city of Seongju, South Korea, clashes took place between protesters and riot police over construction equipment entering the site. While the South Korean Ministry of Defense insisted that repair work for military facilities are required to improve soldiers’ accommodations, protesters countered that the government intended to perpetuate THAAD deployment. The summit could result in two possible scenarios. The first one where Trump and Kim would agree on dismantling North Korea’s nuclear weapons, either through immediate or step-by-step denuclearization. The second possible outcome is failure- in which there is no summit, or the meeting falls apart. If the former plan works, then there is little reason for deploying THAAD, or other missile defense systems, in South Korea as the system is aimed at countering North Korea’s nuclear and missile threats. However, it would still not be easy for Moon to withdraw THAAD shortly after the talks. For instance, Moon’s predecessor Park Geun-hye’s decision to let the United States deploy THAAD was made at the bilateral level. In other words, Seoul’s unilateral withdrawal of THAAD is likely to cause strain and increase the chances of “de-coupling” the U.S.-South Korea alliance. Moreover, because denuclearization cannot be completed in a relatively short amount of time, Kim could suddenly reverse the course for denuclearization, following nearly the same steps his father Kim Jong-il took in 2015. Thus, removing THAAD based on Kim Jong-un’s word alone could prove to be a naive and hasty decision. In contrast, if the talks fail or do not occur, then THAAD should be deployed to protect the South from the North’s military threats. In such a case, President Moon has no option but to face fierce opposition from North Korea and China, which was seen when South Korea deployed THAAD in the first place. Even three days before the inter-Korean summit, North Korea blamed the United States and South Korea for increasing tensions on the Peninsula, arguing that Washington was forcing Seoul to deploy “invasive weapons” and that Seoul had succumbed to American pressure. Additionally, China also expressed outrage over THAAD, claiming that THAAD’s X-band radar will threaten China’s national security by penetrating its territory. Since 2016, as a sign of how strong their complaint is, China retaliated economically against South Korea, especially sanctions on tourism. Meeting with President Moon later in March 2018, Chinese State Councilor Yang Jiechi, China’s top foreign policy official, hinted at withdrawing those retaliatory measures from South Korea but substantive changes have yet to occur. 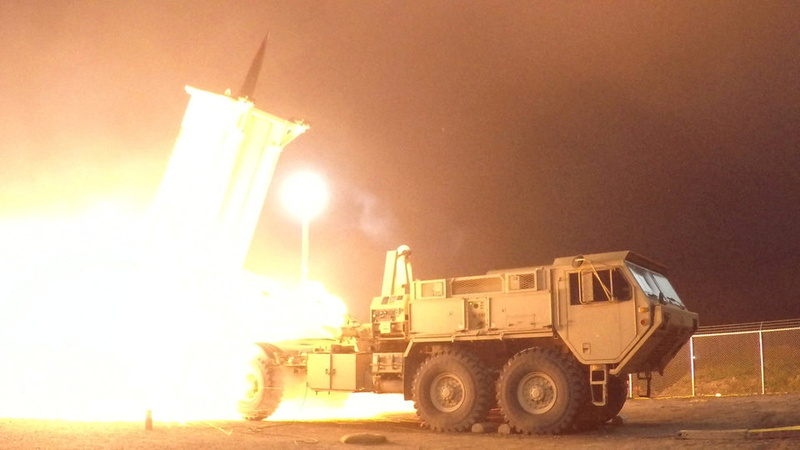 Beyond foreign threats, there are also potential risks at home should Moon withdraw THAAD. To reduce anti-THAAD sentiment and public suspicion of its effects, Moon should keep his 2016 presidential campaign promise and carry out the one-year-long environmental impact assessment. That year-long study will push Moon to tolerate not only the uncertainty of THAAD’s effects but the fact is that the environmental test results will help determine how difficult it will be to persuade the South Korean populace to accept THAAD. Cautious optimism has been ramped up on the Korean Peninsula since Kim Jong-un has come to the negotiating table with a willingness to exchange his nuclear weapons for security guarantees and economic assistance. Still, the outcome of the June 12 summit between Trump and Kim, if it happens, is unknown. Peace might finally be achieved, but history has advised that one should remain suspicious of North Korean promises. Either way, the result will impact the South Korean president’s decision on the deployment of THAAD. Whatever Moon decides, he will confront harsh consequences from his decision. This will be his onerous task. Minhee Jo is an Asan Academy Young Fellow (2017-2018) at the Center for the National Interest and a student at Pusan National University.